January 25th is becoming quite the notable date for retro gamers who own a Nintendo Switch and we now have word of yet another reason to be excited for next week; Irem's 1986 Kid Niki: Radical Ninja (also known as Kaiketsu Yanchamaru in the Land of the Rising Sun) will join the platform and have the radical honor of becoming the second Irem produced game to be available on Nintendo's hybrid system. The self-titled coolest Ninja in Feudal Japan discovers his girlfriend, Princess Margo, has been kidnapped by (we assume) evil Stone Wizard. A perfect plot setup for a seven-level platform/fighting adventure, with seven bosses and presumably not a single Dragon Ball in sight. Despite modest success at the arcades, Kid Niki soared greater heights at the hands of Data East after being ported to NES, even managing to spawn a couple of sequels plus a portable outing for the original DMG Game Boy. After all these decades will Niki remain radical among Switch owners? We'll surely find out next week when it touches down with a price of £6.29 attached. Any particular memories from this Irem offering among our readers? Drop those comments like ninjas drop their foes in the comments section below. are we sure that the people behind this, didn't watch a lot of Dragon Ball while making this? So we have Kid Niki, Strikers 1945 II and Zero Gunner 2 for next week. Celeste too looks like it will be another must buy. Every one of them will be finding a home on my Switch come next Thursday. I know which one I'll be booting up first though. I've beaten this on the NES. I take it the last boss is still Billy Idol? Sweet. Time to get the Irem train rolling. Now, give me R-Type! @Biff_ARMStrong Rebel Yeah he is. Actually I've no idea and if you hadn't mentioned that, I wouldn't even have known he was in there. Never played this. Certainly looks reminiscent of Kung Fu Master, one of their earlier games. @bezerker99 Agreed, though I would like to add Psikyo to that as well. I'm much happier having these arcade classics available than the same old NES/SNES games I've played before. 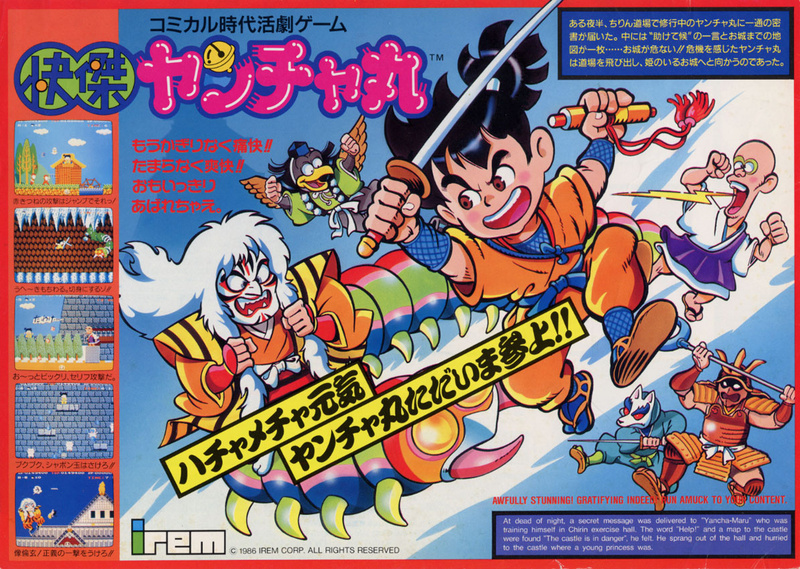 I noticed on the Arcade Archives Wiki page that Ninja Kid is down for a Switch release. I watched some gameplay from it and it doesn't look too appealing though. @Shiryu Ha! You really can tell can't you And this game in turn looks like a spiritual predecessor to Ninja Spirit. @OorWullie Zero Gunner 2 is meant to be completely horrible. It's not a port, but a rewrite called Zero Gunner 2-. There are loads of bugs in the gameplay. Yeah GoNintendo already announced this hours before you guys. Really looking forward to eShop next week as will be full of solid arcade stuff though. @wasilewski Well that's definitely disheartening to hear. I just came across this review of the Switch version though and he goes pretty in depth with it. He's a big fan of the genre and awarded it a 9/10 and said it's an excellent port. It certainly looks the part anyway. I don't remember this one, but it really doesn't look fun to me. Great game, think it was the first game I bought for my NES. This is the arcade version which I’m excited to play with the better visuals than the NES Port. Looks interesting (bright and colorful), but I may have to wait for a review. Can't wait for Moon Patrol to release! @OorWullie It looks more modern and updated than the arcade / Dreamcast version. Some purists won't like this and would expect a direct port. I have to admit that I'm one of those people! I have fond memories of Zero Gunner 2 and would really have liked a direct port, with the original graphics as I think they help retain the original feel. It looks like that will never happen. I'm going to keep my eyes peeled on some other gaming forums and wait to see if they fix the bugs so the gameplay will be somewhat like the original. Loved this on the NES but it's awesome we're getting the arcade version!!! I didn't know irem was still around. Didn't they make Kickle Cubicle? I dug the NES version and appreciate the arcade original as well, it'll be an easy purchasing decision. The tunes are generally four measures on repeat, though, be prepared. @Tempestryke I hope we see "Kickle Cubicle" down the line (Kid Niki has a secret cameo on that game!). Sadly Irem has become a panchislot machine maker after the 2011 eartquake/tsunami. But at least they are willing to sell the rights to redistribute their old games as we have seen elsewhere. Really like the bold and colourful art in this game. That would be nice. I liked Kickle Cubicle. It was a weird, fun little game. "january 25th is becoming quite the notable date for retro gamers who own a nintendo switch"
@ogo79 World Heroes 2, Strikers 1945 II, Zero Gunner 2 and Kid Niki all on January 25th. @ogo79 Bad day for the wallet considering the rest of the non retro stuff hitting the eshop. @Shiryu Space Dave looks like it will be a nice modern retro shoot-em-up to compliment the 2 Psikyo classics,so the 25th just got more expensive. Then the week after we've got Sky Force Reloaded. @OorWullie Not sure if I will byte into Space Dave but definitely looking forward Sky Force Reloaded on February 1st. One of the games where having the Japan version is worthwhile. There's a couple of graphic changes, the main being spiky hair in the west, a bun in Japan. Not a big a deal as Hamster's Magical Drop II but still good to have the choice. It should be noted this is the Japanese release only. I purchased it today from the NA eShop and was surprised to find that although it is listed as Kid Nikki, the game when started is not called Kid Nikki, nor is much of the game text in English. Previous Hamster releases offered the option to switch from NA to JAP, but this one does not. I contacted Hamster's customer service dept. to express interest in an update to correct this issue, otherwise it should be titled something else on the eShop, as Kid Nikki - Radical Ninja is only kind of what you get. The promo video above incorrectly displays the title Hamster put out for us. I miss the 'Atta Boy!' at the end of each level.